Nephroptosis is an abnormal condition in which the kidney drops down into the pelvis when the patient stands up. It is more common in women than men and it is asymptomatic in most patients. It can be characterized by violent attacks of colicky flank pain, nausea, chills, hypertension, hematuria and proteinuria. Nephropexy was performed in the past to stabilize the kidney, but presently surgery is not recommended in asymptomatic patients. nephroptosis: Nephroptosis (also called floating kidney or renal ptosis) is an abnormal condition in which the kidney drops down into the pelvis when the patient stands up and it is more common in women than in men. Nephroptosis, also called floating kidney or renal ptosis, is an abnormal condition in which the kidney drops down into the pelvis when the patient stands up. It is more common in women than in men. It has been one of the most controversial conditions among doctors in both its diagnosis and its treatments. It is believed to result from deficiency of supporting perirenal fasciae. The renal fascia is a layer of connective tissue encapsulating the kidneys and the suprarenal glands. The deeper layers below the renal fascia are, in order, the adipose capsule of the kidney (or perirenal fat), the renal capsule and finally the parenchyma of the renal cortex. The spaces about the kidney are typically divided into three compartments: the perinephric space and the anterior and posterior pararenal spaces. Renal fascia: Transverse section, showing the relations of the capsule of the kidney. Anterior attachment: Passes anterior to the kidney, renal vessels, abdominal aorta, and inferior vena cava and fuses with the anterior layer of the renal fascia of the opposite kidney. Posterior attachment: Fuses with the psoas fascia and side of the body of the vertebrae. Superior attachment: The anterior and posterior layers fuse at the upper pole of the kidney and then split to enclose the suprarenal gland. At the upper part of the suprarenal gland they again fuse to form the suspensory ligament of the suprarenal gland and fuse with the diaphragmatic fascia. Inferior attachment: The layers don’t fuse. The posterior layer descends downwards and fuses with the iliac fascia. The anterior layer blends with the connective tissue of the iliac fossa. 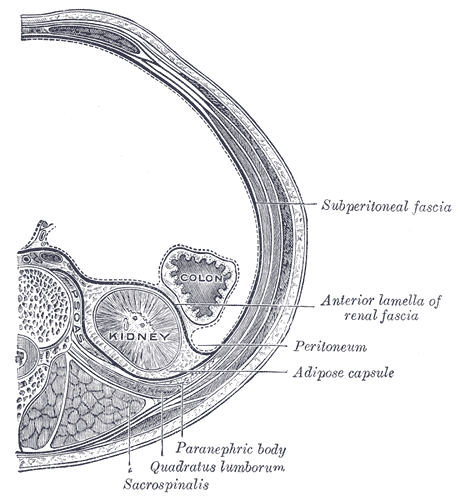 The anterior fascia and posterior fascia fuse laterally to form the lateroconal fascia which fuses with the fascia transversalis. Nephroptosis is asymptomatic in most patients. However, nephroptosis can be characterized by violent attacks of colicky flank pain, nausea, chills, hypertension, hematuria, and proteinuria. Patients with symptomatic nephroptosis often complain of sharp pains that radiate into the groin. Many patients also suggest a weighing feeling on the abdomen. Pain is typically relieved by lying down. The attack of colic pain is called Dittel’s crisis or renal paroxysm. Diagnosis is contemplated based upon patient symptoms. Diagnosis is confirmed during intravenous urography, by obtaining erect and supine films. Nephropexy was performed in the past to stabilize the kidney, but presently surgery is not recommended in asymptomatic patients. Laparoscopic nephropexy has recently become available for selected symptomatic patients.